Two-year-old Khushi Kumari loves racing with her siblings and at the end of each run she gives out a hearty laugh. The only time she breaks into fits of inconsolable crying is when approached by a stranger. 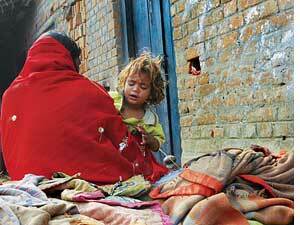 “She fears she would get injections again,” said her mother Dinapati Yadav of Haldichapra village in Patna district. “In September last year Dahaur doctor gave Khushi 16 injections within six days of diagnosing her with polio.” He had prescribed injections for six months. “We could afford only 16, which cost us Rs 2,800, and Khushi could not be cured,” said Yadav, an agriculture labour. Dahaur had claimed a sure-shot remedy, she added. It was not difficult to locate Dahaur’s clinic; everyone in Maner block knew of it. His popularity was evident from the crowd waiting outside his clinic. Inside, Dahaur, in his mid-50s, was administering two injections in quick succession to a five-year-old boy who appeared polio-stricken. He mistook this correspondent for a medical representative and handed a worn out register. “It has data on all polio patients in Maner,” he said. Still attending to his patients, Dahaur said his real name is Yogendra Kumar Singh and he is a homeopath; the college he attended some 20 years ago has been derecognized though. He managed to expand his business on the basis of a certificate hanging strategically on the clinic wall. Issued by the World Health Organisation (who), the certificate read: “Yogendra Kumar Singh is an informer under National Polio Surveillance Project.” This means Dahaur informs who’s Patna office about fresh cases of acute flaccid paralysis (a paralytic condition associated with acute polio) in Maner. He receives Rs 150 for each case reported. Doctors at the Maner government hospital are aware of the popularity of Dahaur and several quacks across the district who promise assured treatment to polio victims. “There is no cure for polio. Depending on the poliovirus and the patient’s response to the infection, we prescribe medication to prevent complications, infections in weakened muscles and to ease pain. The treatment is free,” said assistant medical officer Vinayak Prasad. We also guide them on physical therapy and nutritious diet, he added. Even in private hospitals the treatment does not cost over Rs 600. But not all patients come to us, said Prasad. To understand how Kumar treats polio patients, this correspondent visited his clinic posing as a medical representative. The doctor said his full name is Surendra Kumar and he is an ayurvedic practitioner. Cupboards at his clinic, however, were filled with gifts from allopathic pharma companies. Kumar said he treated Kallu with allopathic medicines: Vitamin B complex tablets (to enhance immune and nervous systems), calcium injections (for strengthening bones) and optineuron (to ease nerve pain). “I also tried mesocarb (a stimulant drug). It’s very good,” he said, adding 10-15 shots of a cocktail of these medicines are required to cure polio. Kumar, however, refused to divulge the combination and claimed his medicines have cured five polio patients in the past six months. Kallu could not be cured because his parents discontinued the treatment, Kumar said. “I paid Rs 3,000 for four injections. I did not have more money and Kumar refused to treat my son,” said Manjhi. None of the polio victims this correspondent visited in Patna district was provided with medicines, medical and nutritional counselling or financial help. Most of them said quacks like Dahaur and Kumar are their only hope. who officials were forthright about their role and said it is confined to surveillance; treatment is the responsibility of the state government. Requesting not to be named, a who official criticized poor health facilities in rural areas and high absenteeism among doctors. On December 6 at the Indira Gandhi Planetarium auditorium, Bihar Chief Minister Nitish Kumar was conferred Rotary International Most Prestigious Polio Eradication Award. He proudly announced, “In Bihar polio has nearly been eradicated.” The data he presented did not support his claims, though. In 2007 the state had 41 P1 polio cases (caused by P1 strain of the virus), in 2008 three cases surfaced and in 2009 the number shot up to 38. C K Mishra, principal health secretary in Bihar, claimed 99 per cent of the children are covered under the polio immunization drive. But the virus skips the grip because of the inaccessible Kosi region that remains flooded for almost six months a year, he said. Mishra, however, failed to explain how poliovirus reaches Patna from distant Kosi. Sources in the state health department linked the failure of the polio immunization drive to migrant labourers, malnutrition and unhygienic living conditions. While they agreed the government fails to treat polio patients who identifies, they also blamed the UN body for taking the help of quacks to strengthen surveillance. who has failed to coordinate with the state government and wants to earn accolades by increasing its surveillance net, they alleged. “Why does it not appoint panchayat workers as informants?” asked an official.